Like the feel of smooth, crisp, and cool sheets? Bamboo sheets might be a great fit for you! Nest Bedding’s bamboo sheets are some of the lowest priced bamboo sheets I have seen to date. Will their low price reflect poor quality and performance, or will these sheets be a great-value buy? Continue reading below to find out! Don’t have time to read the full review? Click here and we’ll take you on down to the review summary. As the name suggests, the Nest Bedding bamboo sheets are constructed from bamboo and made into a lightweight rayon fabric. Similar to most sheet sets, this one includes a fitted sheet, flat sheet, and two pillow cases. 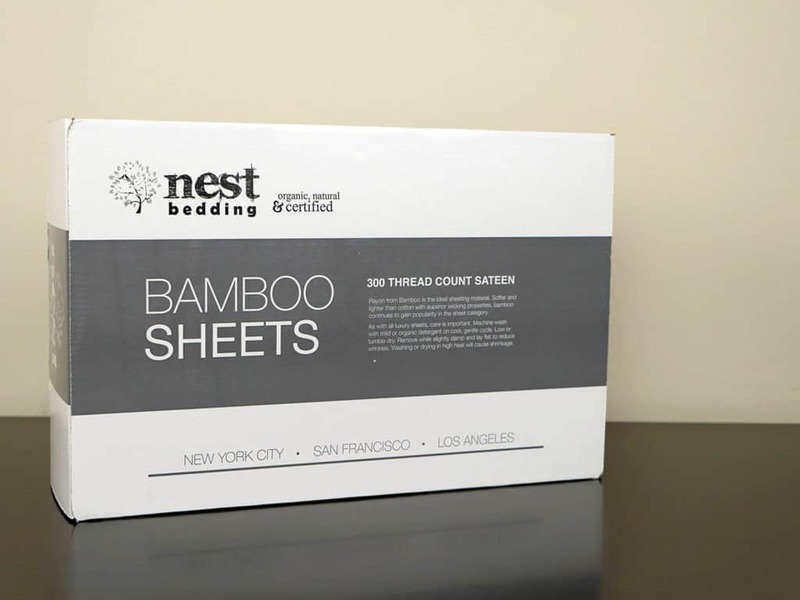 Additionally, the bamboo sheets from Nest contain a 300 thread count and have anti-microbial properties. This can be a major benefit for sleepers with more sensitive skin. The Nest Bedding bamboo sheets also have the ability to fit mattresses with depths of 8″-14″. Although this is somewhat of a large range of depths, there is an elastic band sewn into the fitted sheet that helps to ensure a tight fit around the mattress. Finally, the pillow cases use an open end design. This allows for an easier way to insert and remove the pillow from the case. All things considered, the bamboo sheets have a very good build quality. I measure build quality by examining the stitching, material quality, and overall construction. After taking a close look at the overall stitching of these sheets, I was only able to find a total of two loose threads. Between the flat sheet, fitted sheet, and two pillow cases, finding only two loose threads is an impressive feat. In addition, the two threads I found were easily removed without creating any further damage to the fitted sheet whatsoever. Therefore, they could easily be considered excess material instead of loose threads. Regardless, Nest Bedding did a fine job of putting together a virtually flawless sheet set. Throughout my testing of Nest Bedding’s bamboo sheet set, I steered my focus towards a few main categories. For starters, shrinkage. 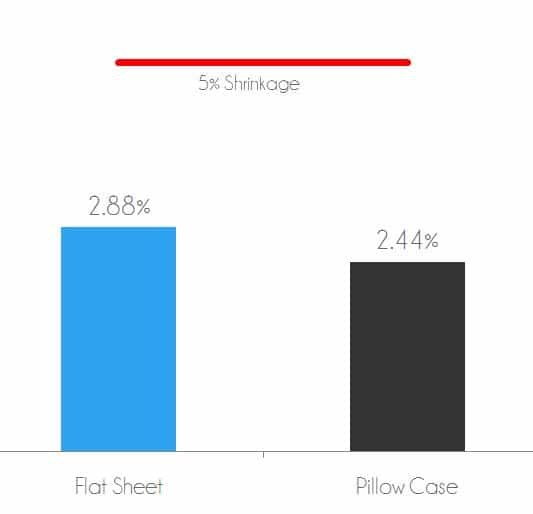 Shrinkage is typically one of the most commonly complained about areas when it comes to purchasing new sheets. No consumer wants to buy a new set of sheets and bring them home only to find out they shrank an undesirable amount after a single wash / dry cycle. Following shrinkage, I conduct a thread examination. Are there any notable loose threads? Have any new threads come about since the wash / dry cycle? Have any existing threads become worse after the wash / dry cycle? Last but not least, I test the color / dye run off of the sheet set. Shrinkage tests are crucial in determining the overall quality of the sheet. To kick things off, I take measurements of the flat sheet and pillow case (prior to wash / dry cycle). These will serve as my baseline measurements for comparison. After doing so, I run the sheets through a standard wash and dry cycle and record new measurements after the cycle is complete. Next, I compare the two sets of measurements and determine the amount of shrinkage in both the flat sheet and pillow case. 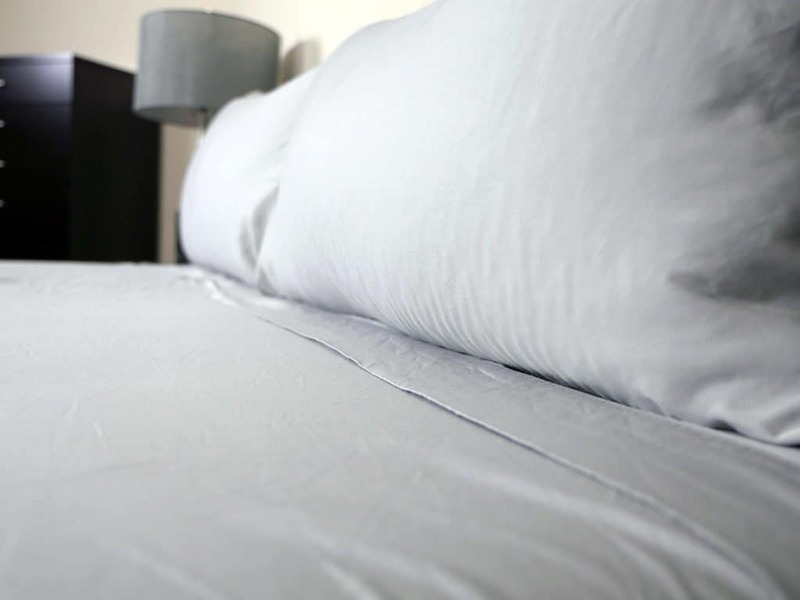 The flat sheet shrank by a total of 2.88% (compared to its original size) and the pillow case shrank by 2.44% (compared to its original size). Typically, a majority of the shrinkage takes place during the first wash / dry cycle. Therefore, I would not expect to see much more shrinkage, if any. During this test, I take another deep analysis of the sheets for any new issues or damages that could have occurred from the normal use and several wash / dry cycles. After further examination, the Nest Bedding bamboo sheets did an excellent job of maintaining their composure. I did not find any new issues with the sheets upon further review. The color test is designed to highlight any color / dye run off (if any) from the sheets. To begin with, I soak a pillow case in warm water and allow the case to fully absorb the water. Once this is complete, I do my best to ring out any excess water that may be stored in the pillow case. Next up, I lay down a few paper towels and use a rolling pin to firmly press the pillow case against the paper towels. By doing so, I am trying to test whether or not the sheets contain low quality color / dye materials. Per my test results, the Nest Bedding bamboo sheets did not show any sort of color / dye run off. Nest Bedding’s bamboo sheets have quite a nice feel about them. As a lighter material, the rayon (made from bamboo) used in these sheets offers a soft, delicate feel. Instead of being smothered by the sheets, it felt more like they were floating on top of me to a certain degree. During my sleep test I was able to easily change positions without yanking the sheets away from my wife, and vice versa. As I rotated from my stomach to my side, my body would glide smoothly underneath the sheets, allowing them to remain in the same position as they previously were. On a scale of 1 to 10, where 1 is the softest, I would say the Nest Bedding bamboo sheets nail a 3 out of 10 feel. Another impressive characteristic about these sheets was their ability to remain cool. Bamboo has natural moisture wicking properties, which helps to avoid heat build up between the sleeper, the sheets, and the mattress. More often than not, sheets act as a warmer middle man between the mattress and the sleeper. That was not the case with these bamboo sheets. A 300 thread count allows air to flow in and out of the sheets easily, all while the rayon fabric provides a natural cool to the touch feeling. This combo makes for a cooler sleeping surface and generally a more comfortable feel overall. Last but not least, style. The bamboo sheets are offered in four different colors (Silver Moon, Creamy Chocolate, Cool Khaki, and Wispy White), giving the sleeper a little more variety. For the purpose of this review, I tested the Silver Moon. While there might not be an exciting pattern about these sheets, the colors provide a sharp, mature, and sleek look to any mattress. Should I buy the Nest Bedding Bamboo sheets? All things considered, I’m a fan of the Nest Bedding bamboo sheets. The material quality, build quality, shrinkage results, style, and feel of these sheets make for a very well rounded, good value set of sheets. Nest Bedding did a fine job of combining luxury, affordability, and comfort into these sheets. By offering four different colors, Nest Bedding gives sleepers a wider variety and really allows them to pick and choose more of a personalized color scheme. Want bamboo sheets – Bamboo sheets are cool, light, soft, and slightly thinner than most cotton sheet sets. You’ll want to be sure you’re a fan of these characteristics before moving forward with the Nest Bedding bamboo sheets. Want a quality sheet set – These sheets seem to be very well made. After running the entire set through several wash / dry cycles and using them for a few weeks, I feel like they have held up quite well. Only two loose threads were found in this sheet set once removed from the original packaging. No further threads popped up throughout the entirety of my sleep test. Want a great deal – At $99 for a Queen-size set of bamboo sheets, this set is an extremely good value. I have not seen a more affordable set of bamboo sheets to date. Want to buy from a reputable company – Nest Bedding has been producing quality sleeping products for the better part of 6 years now. Year after year they continue to impress me with their new sheets, pillows, mattresses, etc. If you’re looking to buy from an established company, Nest Bedding is certainly one to consider. Looking for more information on the sheets? Check them out over at NestBedding.com. The Nest Bedding bamboo sheets are in a bit of a unique space. Their combination of luxury and affordability makes for one of the better valued sheet sets I have tested to date. A cool to the touch feel blends nicely with the soft and smooth texture these sheets offer. If you’re in the market for new sheets and would rather not spend a fortune, but would also like to not short yourself in terms of quality, the Nest Bedding bamboo sheet set is definitely one to consider.